ARLINGTON, Va.–Scientists sponsored by the Office of Naval Research (ONR) have genetically modified a common soil bacteria to create electrical wires that not only conduct electricity, but are thousands of times thinner than a human hair. As electronic devices increasingly touch all facets of people's lives, there is growing appetite for technology that is smaller, faster and more mobile and powerful than ever before. Thanks to advances in nanotechnology (manipulating matter on an atomic or molecular scale), industry can manufacture materials only billionths of a meter in thickness. The ONR-sponsored researchers–led by microbiologist Dr. Derek Lovley at the University of Massachusetts Amherst–say their engineered wires can be produced using renewable "green" energy resources like solar energy, carbon dioxide or plant waste; are made of non-toxic, natural proteins; and avoid harsh chemical processes typically used to create nanoelectronic materials. "Research like Dr. Lovley's could lead to the development of new electronic materials to meet the increasing demand for smaller, more powerful computing devices," said Dr. Linda Chrisey, a program officer in ONR's Warfighter Performance Department, which sponsors the research. "Being able to produce extremely thin wires with sustainable materials has enormous potential application as components of electronic devices such as sensors, transistors and capacitors." The centerpiece of Lovley's work is Geobacter, a bacteria that produces microbial nanowires–hair-like protein filaments protruding from the organism–enabling it to make electrical connections with the iron oxides that support its growth in the ground. Although Geobacter naturally carries enough electricity for its own survival, the current is too weak for human use, but is enough to be measured with electrodes. Lovley's team tweaked the bacteria's genetic makeup to replace two amino acids naturally present in the wires with tryptophan–which is blamed (incorrectly, some say) for the sleepiness that results from too much Thanksgiving turkey. Food allegations aside, tryptophan actually is very good at transporting electrons in the nanoscale. "As we learned more about how the microbial nanowires worked, we realized it might be possible to improve on nature's design," said Lovley. "We rearranged the amino acids to produce a synthetic nanowire that we thought might be more conductive. We hoped that Geobacter might still form nanowires and double their conductivity." The results surpassed the team's expectations as the synthetic, tryptophan-infused nanowires were 2,000 times more conductive than their natural counterparts. And they were more durable and much smaller, with a diameter of 1.5 nanometers (over 60,000 times thinner than a human hair)–which means that thousands of nanowires could possibly be stored in the tiniest spaces. Lovley and Chrisey both say these ultra-miniature nanowires have numerous potential applications as electronic and computing devices continue to shrink in size. For example, they might be installed in medical sensors, where their sensitivity to pH changes can monitor heart rate or kidney function. 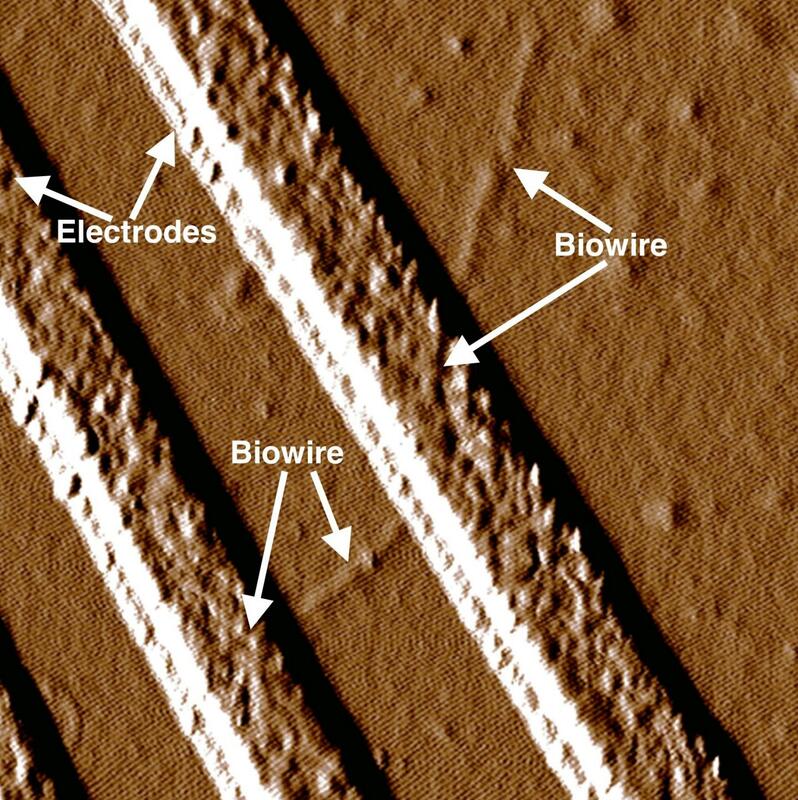 From a military perspective, the nanowires could feed electrical currents to specially engineered microbes to create butanol, an alternative fuel. This would be particularly useful in remote locations like Afghanistan, where fuel convoys are often attacked and it costs hundreds of dollars per gallon to ship fuel to warfighters. Lovley's nanowires also may play a crucial role in powering highly sensitive microbes (which could be placed on a silicon chip and attached to unmanned vehicles) that could sense the presence of pollutants, toxic chemicals or explosives. "This is an exciting time to be on the cutting edge of creating new types of electronics materials," said Lovley. "The fact that we can do this with sustainable, renewable materials makes it even more rewarding." Lovley's research is part of ONR's efforts in synthetic biology, which creates or re-engineers microbes or other organisms to perform specific tasks like improving health and physical performance. The field is a top ONR research priority because of its potential far-ranging impact on warfighter performance and fleet capabilities.